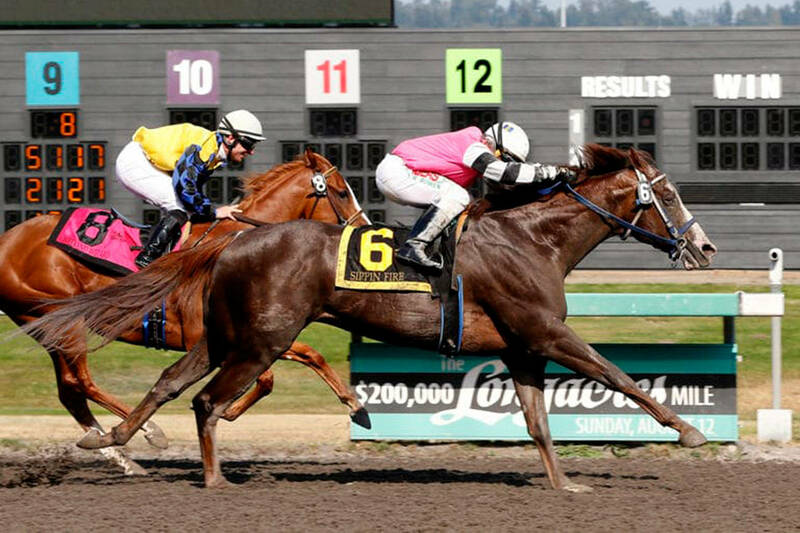 Citizen Kitty wore down Invested Prospect and held off Gazing for a 1 ¼-length victory Sunday in the $21,500 Muckleshoot Casino Purse for older fillies and mares at Emerald Downs. With Jose Zunino aboard, Citizen Kitty ran 5½ furlongs in 1:03.15 and paid $8, $4.40 and $2.40. Jeff Metz is the winning trainer for the Highlander Racing Stable. It was a triumphant return for last year’s track and state champion older filly or mare, out of the money in three starts earlier this year at Santa Anita. Citizen Kitty improved to 4-3-0 in her last seven starts at Emerald Downs, including wins in the Emerald Distaff, Boeing Stakes and Hastings Stakes. A 6-year-old Washington-bred by Proud Citizen-No Constraints, Citizen Kitty is 8-5-5 in 30 starts overall, with earnings of $214,551. Gazing, ridden by Rocco Bowen, rallied in tandem with Citizen Kitty but was outfinished in the final furlong and paid $4.20 and $2.40. A 4-year-old by Harbor the Gold, Gazing is 3-3-0 in six starts for trainer Terry Gillihan and owner William Sandeman. Invested Prospect, the 11-10 favorite ridden by Julien Couton, led through fractions of :21.97 and :44.99, carried a one length into the stretch but was overtaken in the final sixteenth of a mile. Invested Prospect, Citizen Kitty’s younger sister, paid $2.10 to show. It was her first defeat in six career sprints at Emerald Downs. My Heart Goes On and Little Dancer completed the order of finish. Notes: Metz and Zunino also combined with Ya Chunka Monka ($15.60) in a $15,000 claimer for 3-year-olds, and the Soldat colt covered 5½ furlongs in a brisk 1:03.06. .. With his second straight training double and third already this season, Metz jumped into first place with six wins atop the trainers’ standings. … The $0.50 Pick 5 paid a whopping $23,057 – second largest of the season and second biggest in track history. The previous high was $23,306 on April 22. … Ryan Walt ($42.40) prevailed in a four-horse blanket finish in Sunday’s fifth race, which proved the knockout punch for most Pick 5 players. The sequence also included a pair of 6-1 shots and Citizen Kitty’s upset of Invested Prospect in the feature. … Rojo Bou Peep ($4.40) became the meet’s first two-time winner, rallying for an easy victory in the Sunday opener for trainer Joe Toye and owner Rick Kessler. … Rocco Bowen, rider of Rojo Bou Peep, has won with 20 of his last 38 mounts for Toye. … Bowen rode three winners Sunday and tops the jockeys’ standings with 10 wins. … Kevin Orozco rode two winners Sunday and is second with six wins. … 2017 Washington Horse of the Year Mach One Rules breezed five furlongs in a Bullet :57 3/5 Sunday at Emerald Downs…Racing resumes Friday with first post 6:30 p.m. It’s Fabulous Friday and the first 4,000 fans receive free Fab Friday T-shirts that are good for free admission every Friday throughout the season. There also is a $7,015 carryover in the $0.20 Jackpot Pick 7.